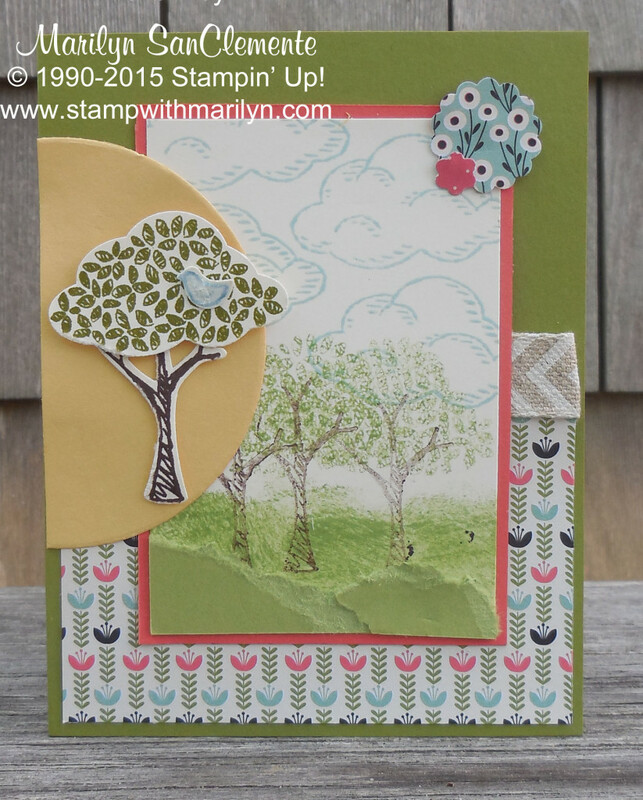 Marilyn SanClemente July 20, 2015 July 20, 2015 All Occasion Card, Handmade cards, Mojo Monday Sketch Challenge, Stampin' Up! Today I have another card designed with the Sprinkles of Life Stamp set and Pretty Petals Designer paper from Stampin’ Up! 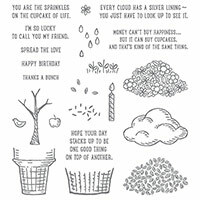 I am really loving the versatility of the Sprinkles of Life stamp set. This set comes with a coordinating Tree Builder punch – so no cutting of images and there are a variety of cards that can be made with these really neat images… I have made a card with a flower basket (use the bottom of the cupcake), a birthday cupcake and an ice cream cone. One of the topping stamps can be used to make the toppings of a cupcake, layers of an ice cream cone or clouds! And the best part of this set is that $3 from the proceeds from this set go to the Ronald McDonald House which is Stampin’ Up!’s supported charity. The card base is Old Olive which has been cut to 8 1/2″ x 5 1/2″ and scored at 4 1/4″ and folded in half. I added a 2 3/4″ x 4″ piece of floral designer paper from the Pretty Petals Designer paper stack. Next is a piece of Chevron ribbon. The background image is stamped on a layer of very vanilla cardstock ( 2 3/4″ x 4″) that I sponged with Pear Pizazz ink to look like grass. 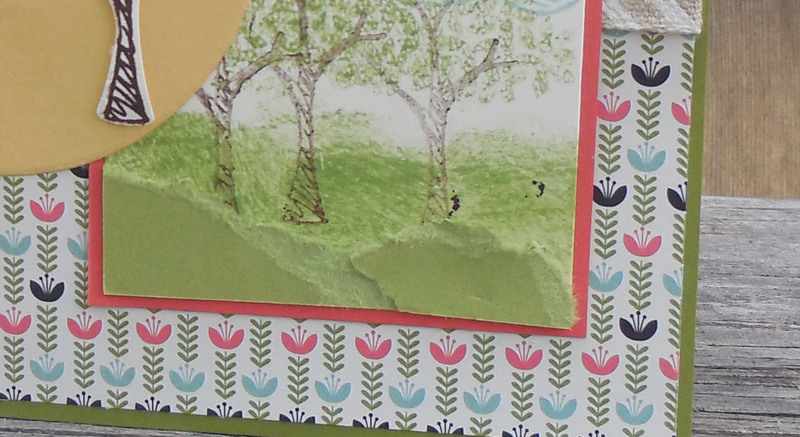 I then stamped the trees with Chocolate Chip ink and Pear Pizazz ink. NOTE: I stamped off the trees and leaves on scrap paper to make a lighter shadow image to give the look of a background forest. The clouds are stamped with Soft Sky ink. To add a little more depth to the grass, I added 2 scraps of pear pizazz cardstock that I ripped to make a raw edge. I love this look for natural backgrounds. Last I stamped the tree trunk with Chocolate Chip ink and the leaves with Old Olive ink on scraps of very vanilla cardstock. They were punched out using the Tree Builder punch and added to a half circle cut from So Saffron cardstock. I used dimensionals to help this image to pop. Last but not least I added a little blue bird that was stamped with Marina Mist Ink. How fun! Love that sweet little tree. Thanks for playing along with Mojo Monday!